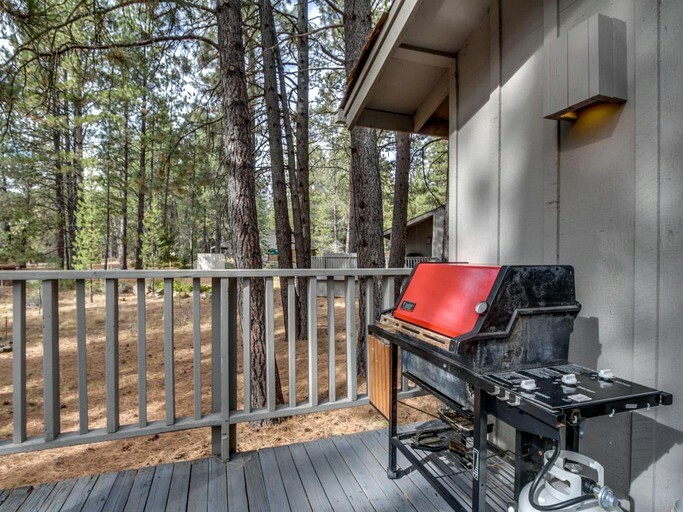 This pet-friendly vacation rental near Bend, Oregon, features three bedrooms, two bathrooms, and can sleep up to six guests comfortably with an eight guest maximum occupancy. 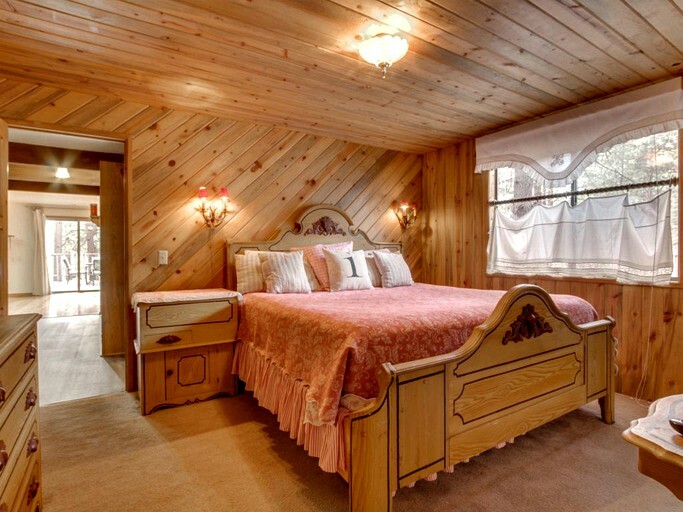 The master bedroom features a king-size bed, wooden furniture, and a full bath with a combined shower and tub, sink, and toilet. 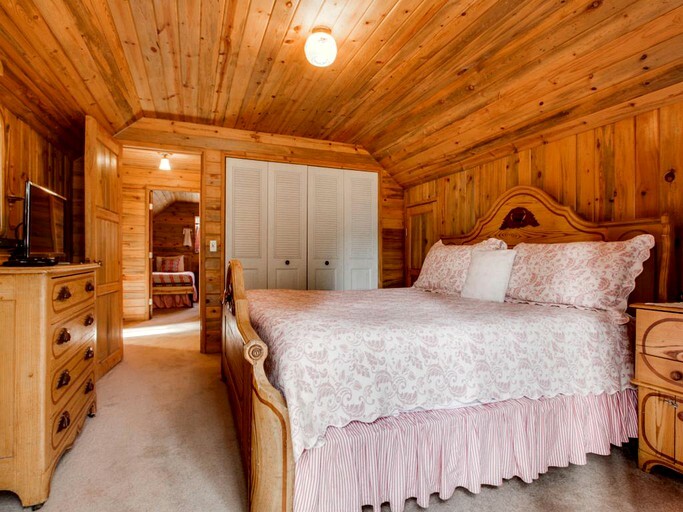 The second and third bedrooms are located on the second floor. 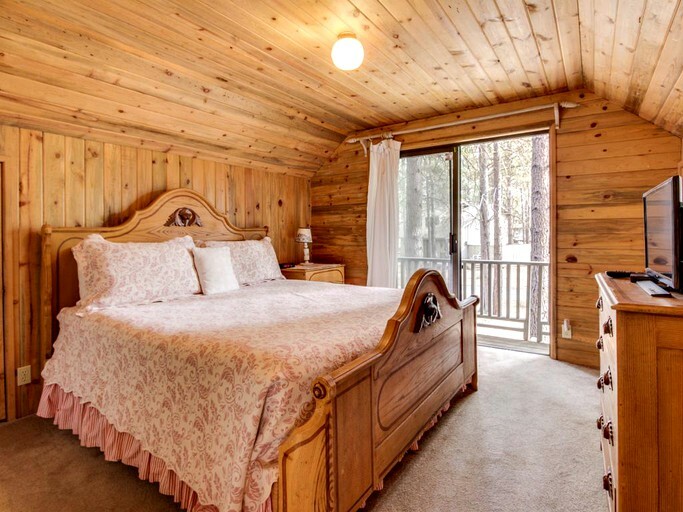 The second bedroom features another king-size bed, a TV, wooden furniture, and access to a second story balcony. 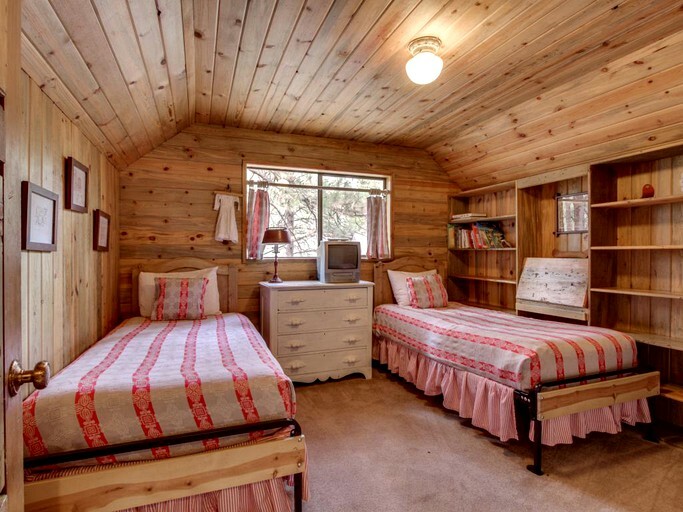 The third bedroom features two twin beds, wooden storage space, and a small TV, making it the perfect space for kids. 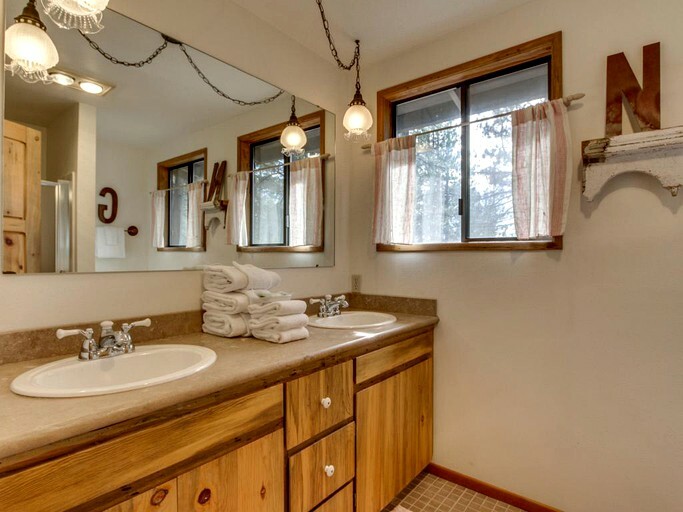 The second full bathroom is also located upstairs and features double sinks, a combined shower and tub, and a toilet. 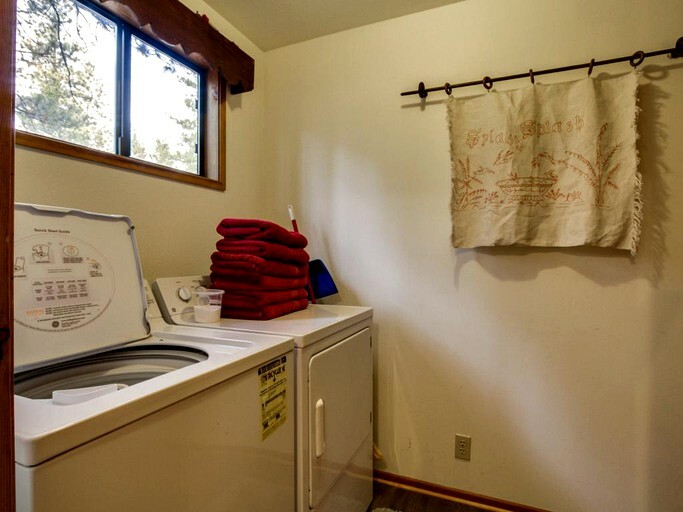 Additionally, the private washer and dryer are also located on the second floor. 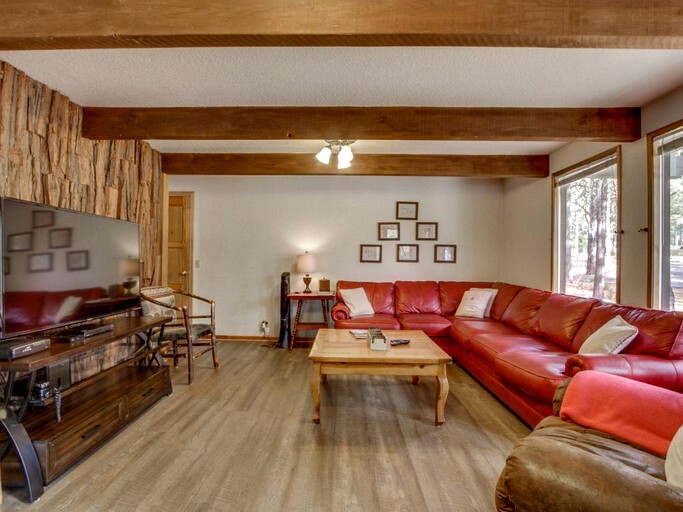 In the spacious living room guests will find a large leather sectional sofa and a comfortable arm chair with bright windows letting in ample natural light. 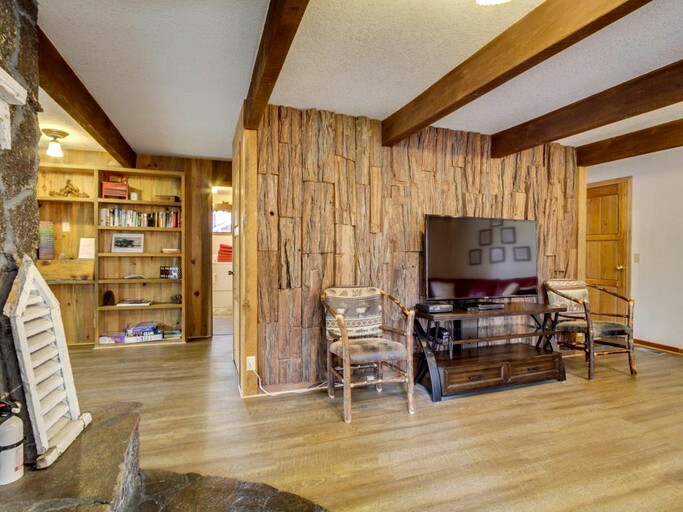 A large flatscreen TV and wood-burning fireplace can also be found in the living room. 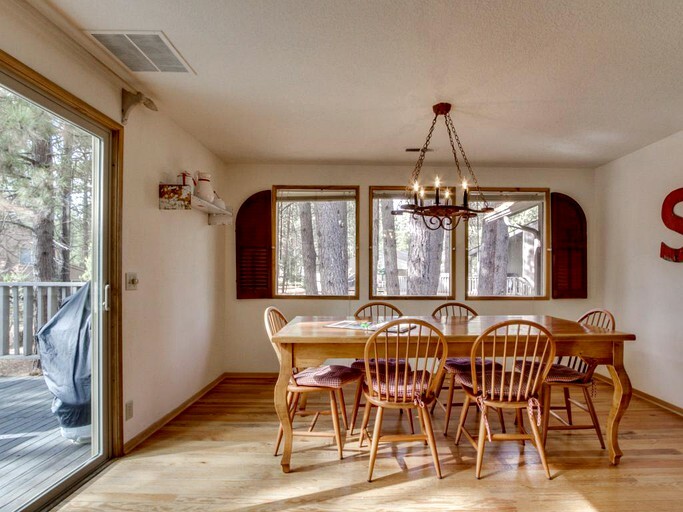 In the room next to the living room is the kitchen and dining area, with a large dining table and seats for six. 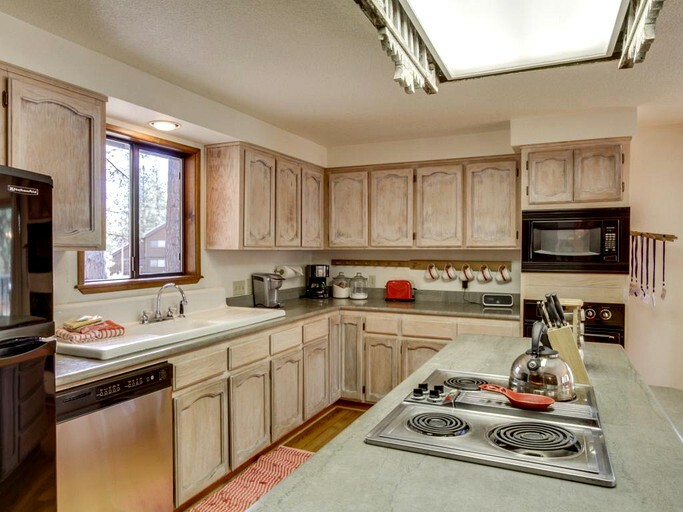 The fully-equipped kitchen features large counter spaces and modern appliances including an electric stove, oven, microwave, refrigerator, coffeemaker, and dishwasher. 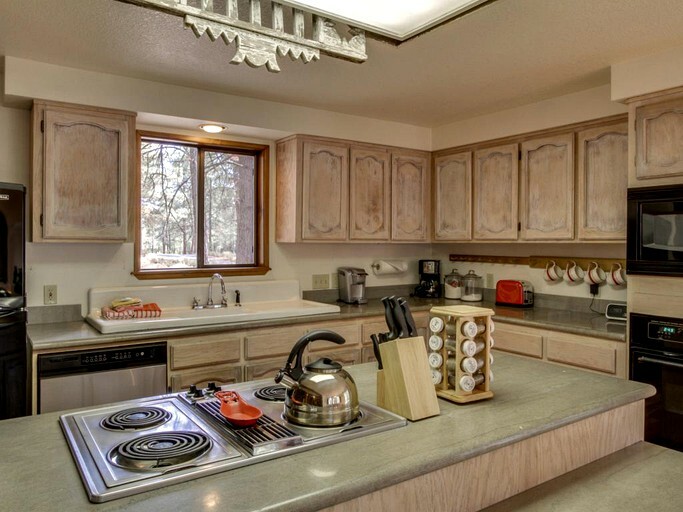 All the necessary cookware, dinnerware, and spices can be found in the wooden cabinetry for the perfect homemade meal. 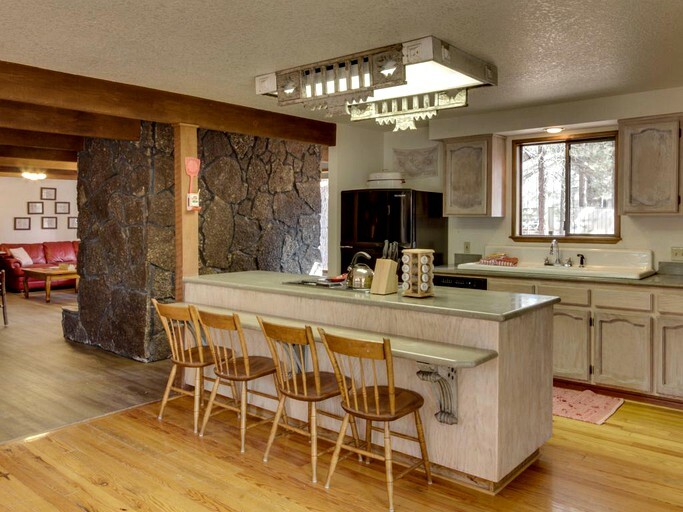 Additionally, a bench with several chairs is attached to the counter space in the kitchen where guests can enjoy their breakfast or play some board games together. 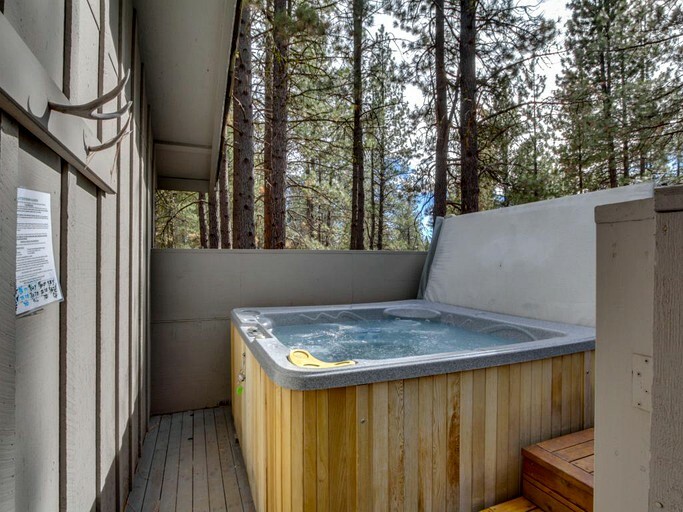 This unique accommodation features a private hot tub, game room, free SHARC passes, and more amenities for guests to enjoy. 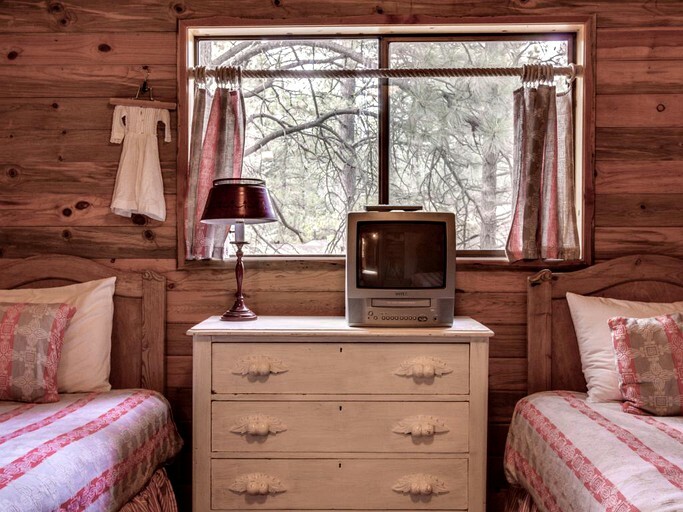 Inside the cabin guests will find handcrafted wooden furniture, exposed timber beams, and pine walls throughout the accommodation. 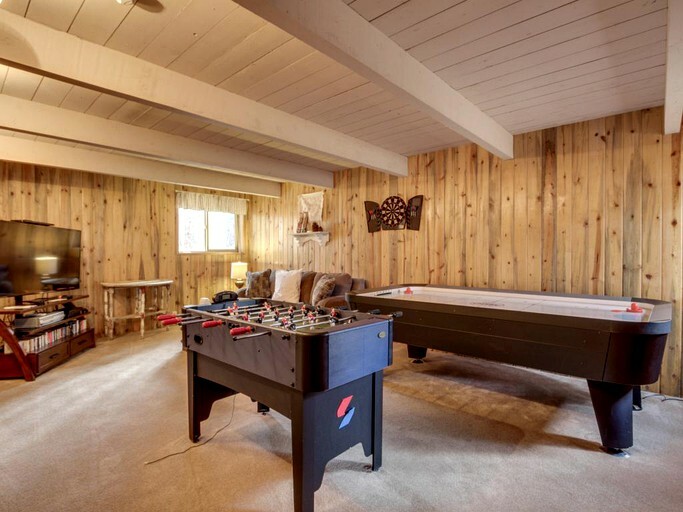 The game room at this cabin offers games including air hockey, foosball, a gaming system on a flatscreen TV, and darts. 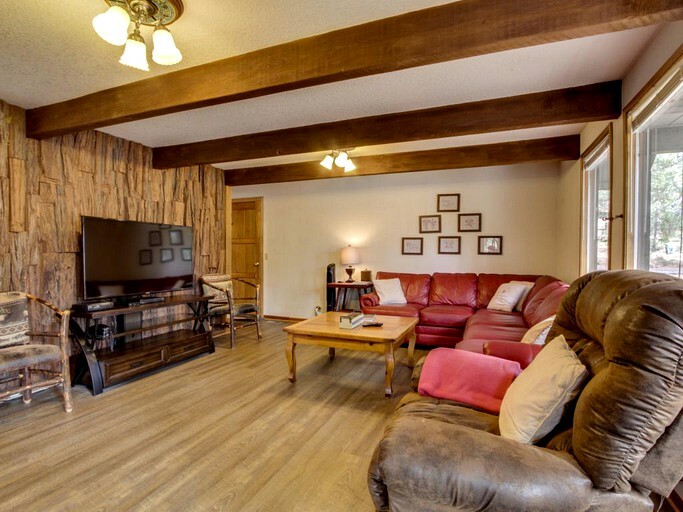 For additional entertainment, guests can enjoy the complimentary WiFi, cable TVs, Netflix streaming, movies, and selection of board games provided on site. 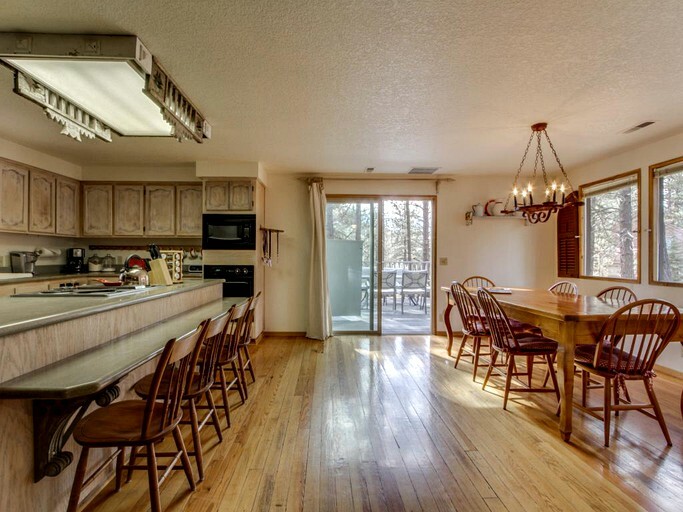 Additionally, this accommodation provides eight adult bikes and 6 child bikes for family biking trips. 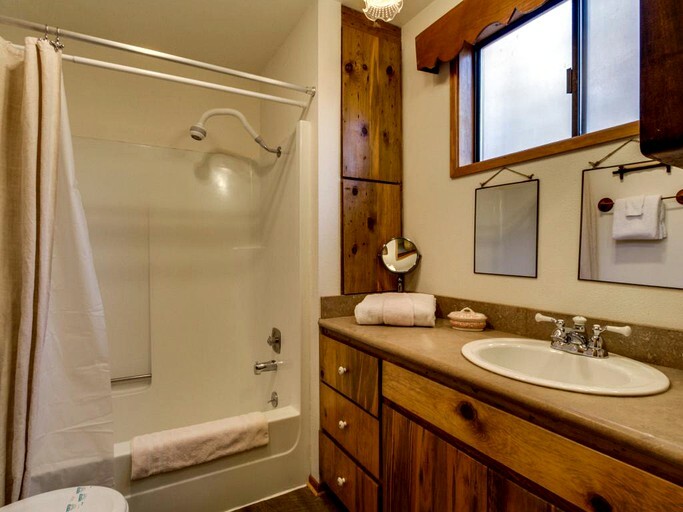 For added comfort, guests will find a wood-burning fireplace and a private washer/dryer unit on site. 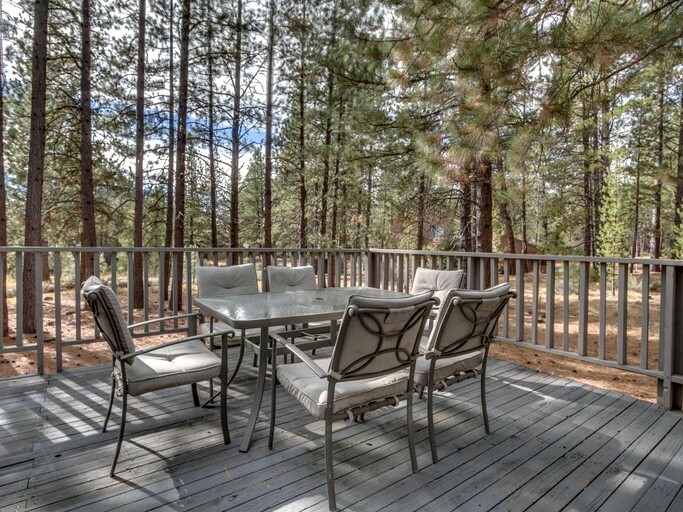 There is also a private balcony and patio featuring a gas grill and an outdoor dining table for barbecues in the summer. 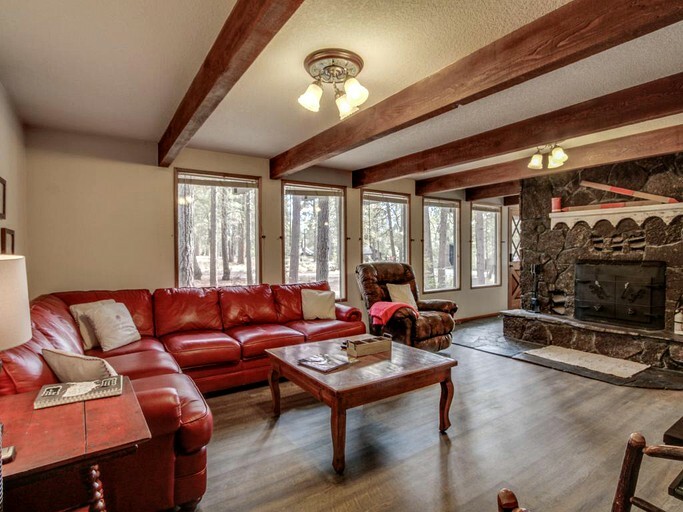 This property is located in Sunriver, Oregon. 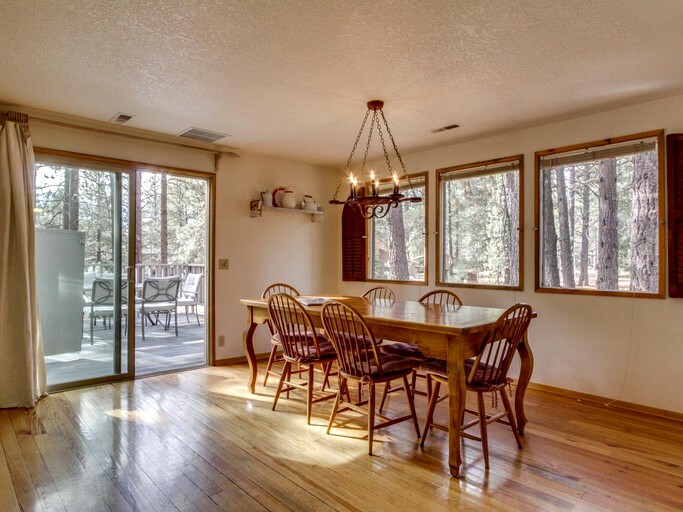 Sunriver is a community consisting of recreational facilities and the popular Sunriver Resort. 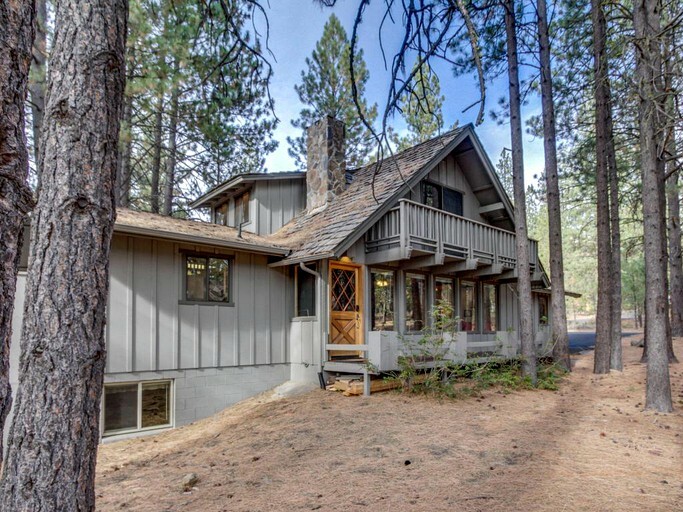 It is located on the eastern side of the Deschutes River in Deschutes County. 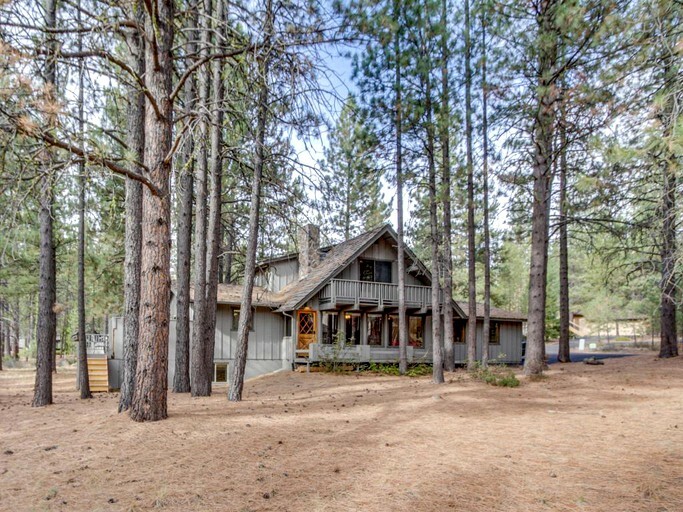 It is about fifteen miles south of Bend at the base of the Cascade Range. 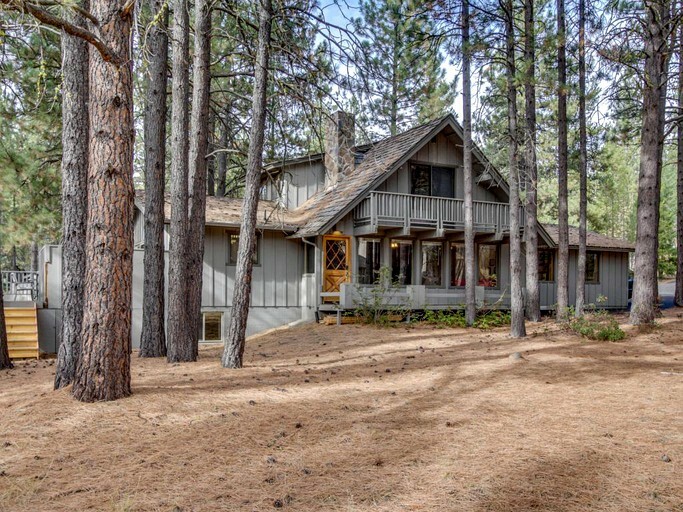 The town has four golf courses, two of which are for private use, and the Sunriver Homeowner's Aquatic and Recreation Center, also known as SHARC. 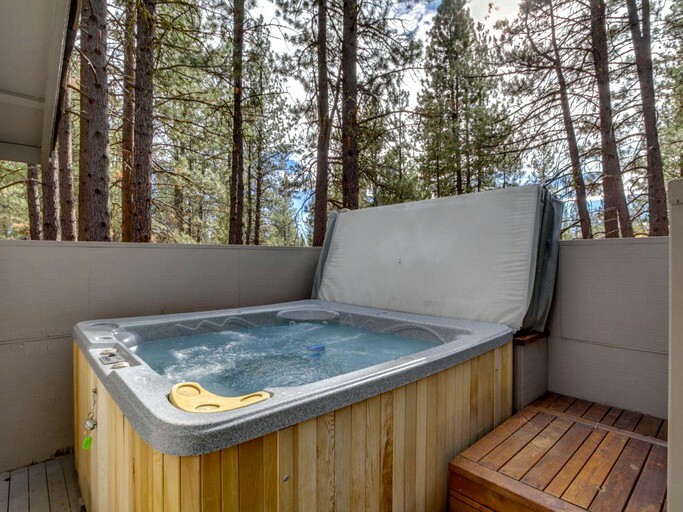 This accommodation has a wide variety of exciting and relaxing activities for guests to enjoy during their stay. 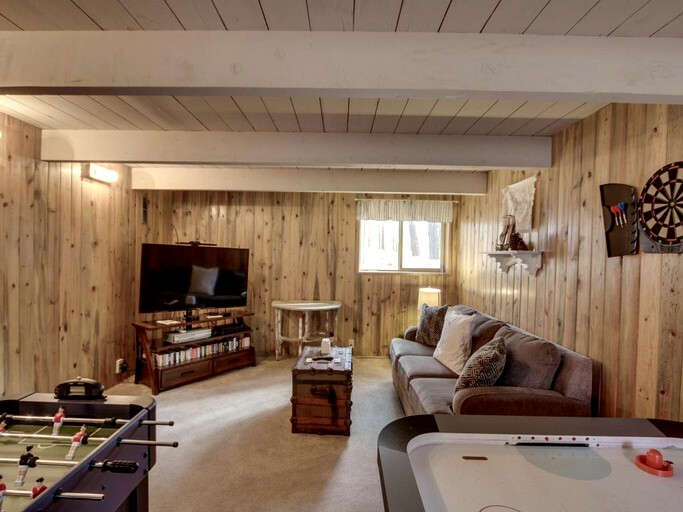 On site, guests can spend the day playing the selection of games in the game room, take a relaxing soak in the hot tub, or enjoy a movie marathon while getting cozy by the fireplace. 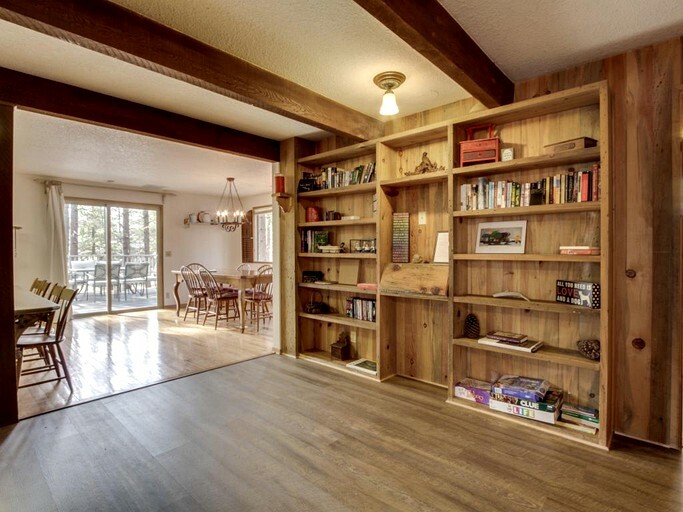 During summer months, guests can whip up a delicious meal on the barbecue and dine outside while the sun sets, then head inside for a family game night using the selection of board games. 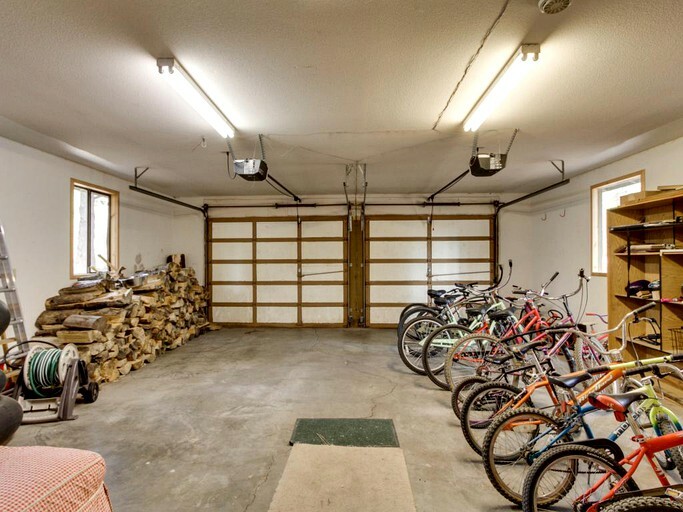 In the daytime, guests can go on bike rides using the provided bikes and explore the surrounding area of the property. Additionally, guests can use the free SHARC passes and take advantage of the pool, basketball courts, and other amenities of the recreation facility. 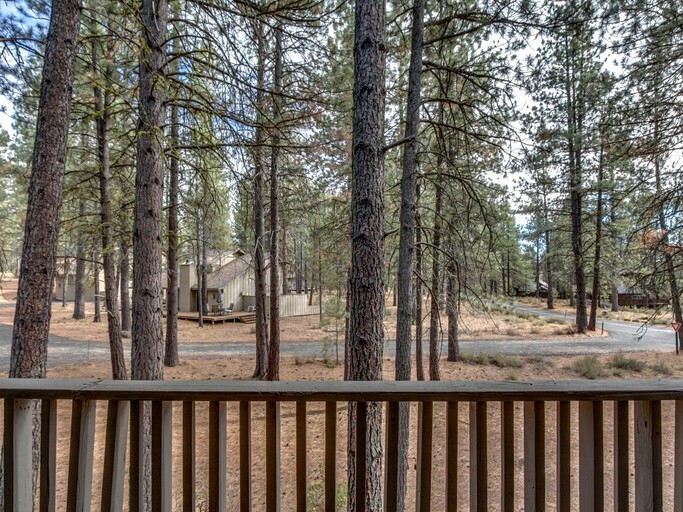 Venturing off site, glampers can practice their swing at the nearby Meadows Golf Course or explore the miles of paved paths on bike or horseback. During the winter, guests can enjoy all the winter activities at Mt. Bachelor including skiing, snowboarding, snowshoeing, and sledding. 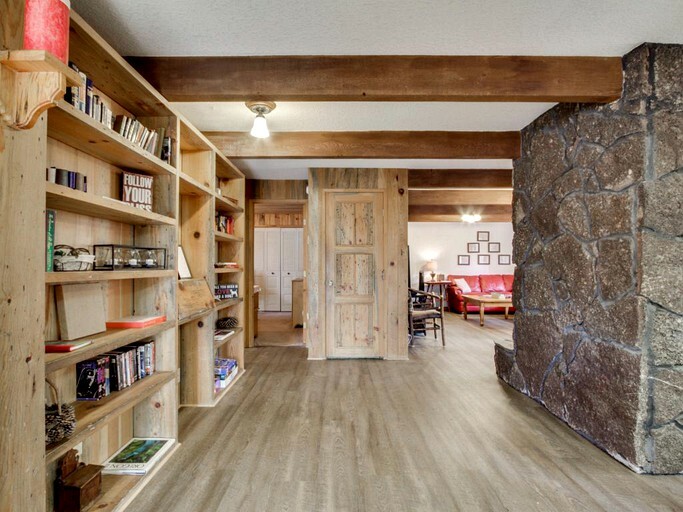 In the summer, rock climbing and hiking are available to guests in the surrounding countryside. 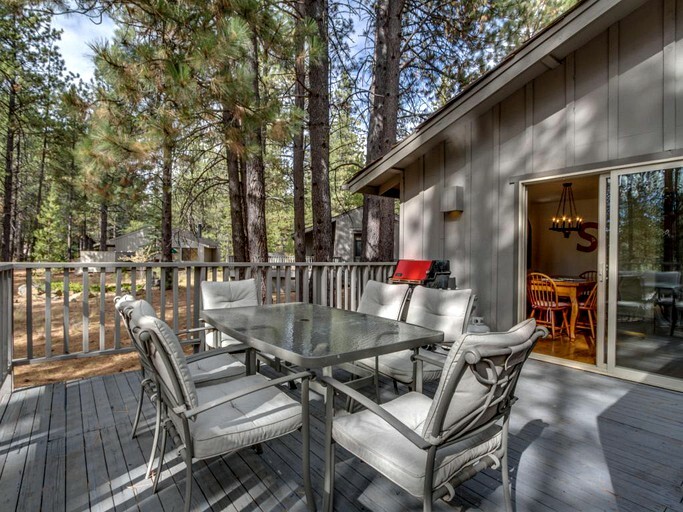 In Sunriver, guests can explore the wide variety of shops, restaurants, and cafes of the charming town. Day trips to the bustling city of Bend will introduce guests to even more shops and restaurants in a more urban environment.